Most stories—most good ones, anyway—have a size. Sometimes they’re huge, on par with “Henry V” or “Gone with the Wind”; sometimes they’re tiny, focused on one person or relationship or moment in time, as with Richard Linklater’s “Before” trilogy or, more recently, Jim Jarmusch’s “Paterson.” The best, of course, are both (and to be fair, most of those examples have moments of intimacy or expanse.) Scott Frank’s “Godless” has a size in mind. From the very earliest frames, it’s apparent that this story is aiming for epic, perhaps with an ornate capital E. The trouble is that at its best, "Godless" is much, much smaller. Throughout its seven episodes, most of which clock in at around 75 minutes, “Godless” asserts its own sprawling nature almost relentlessly: one shot of a wild, untamed landscape begets another, frequent sepia-toned flashbacks baldly capture unspeakable horrors, and we’re told ad nauseum that the central conflict is not simply epic, but biblical in its scope. It’s the small moments that linger, and yet they’re adrift in all that sprawl. When you take a photo and blow it up, you run the risk of losing the substance, the central figures becoming a blur of colored pixels that don’t quite add up to a face. 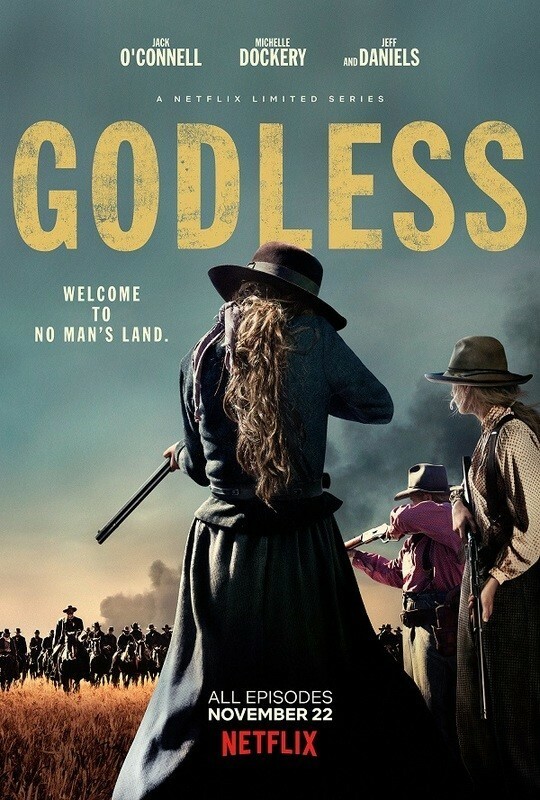 At its best, “Godless” is terrific. At its worst, it’s like that overblown photo—the scale of the story is right, but the resolution is all wrong, and so the stuff that matters ends up fuzzy and indistinct. It’s easy to understand how that might happen. Frank’s story is the stuff of epic storytelling, a western that follows the bloody conflict between Roy Goode (Jack O’Connell), an illiterate sharpshooter orphaned at a young age, and his surrogate father Frank Griffin (Jeff Daniels), a bible-toting psychopath with a soft spot for those in need of a family. After Goode betrays Griffin, ordinary people find themselves caught in the crossfire, notably the women of La Belle, New Mexico, nearly all of whom were widowed by the collapse of their local mine. Unbeknownst to almost all concerned, calamity draws ever nearer, even as we get to know Alice (Michelle Dockery), the woman who shelters Goode, or Mary Agnes (Merritt Wever), the matter-of-fact, pants-wearing woman acting as mayor. There’s also Scoot McNairy as a sheriff with a secret affliction, Thomas Brodie-Sangster as his brave but sometimes foolish deputy, Frank’s band of assassins, and countless others. On the plus side, nearly all of the characters are treated with empathy and thoughtfulness, and given rich, complex lives. On the negative side, nearly all of the many, many characters are given rich, complex lives. It’s great, but a viewer can only take so much. When everyone’s struggle matters, when every shot is loaded with meaning and texture, and when all the threads of the story have plenty of heft (and get the appropriate pregnant pauses and lingering looks), one runs the risk of developing a righteous case of importance fatigue. There’s an easy way to inoculate yourself, of course. Simply don’t binge the thing. Still, that’s odd advice to offer in relation to a Netflix property. While this can fairly be called a mixed review—what with all the importance underlined, and then underlined again, and then often once more for good measure, it’s not something I can unabashedly recommend—it should by no means considered a pan. In many respects, “Godless” is a remarkable achievement, a western that embraces the essential elements of the genre, all while exploring themes and questions that it’s tough to imagine John Wayne wading into: queerness and gender identity, race and religion, the aftermath of sexual violence and the complicated reality of life as an other. It’s beautifully, almost rapturously filmed, well-written, and thoughtfully staged, particularly when it comes to the many scenes of violence. It’s unafraid of the realities of brutality, and treats death as a constant visitor. 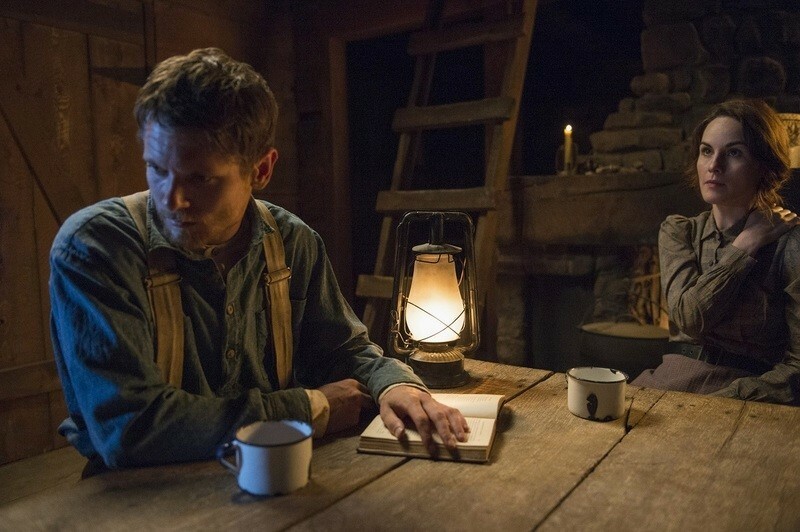 Still, the greatest strength of “Godless” is its cast, and that very strength makes the series such a frustrating viewing experience. Daniels, for example, is in top form, drawing out Griffin’s many contradictions with verve but without ever a trace of showboating. The scenery remains fully intact, and yet Griffin still seems one mustache-twist away from Snidley Whiplash territory. It’s because the series shows us, rather than tells us, how epic this showdown will be, how biblical, how messed up. Any time we approach an understanding of the character, it’s because Daniels has drawn us in. Any time we’re detached, it’s because the dialogue aims to dictate emotional reaction. With one exception, that’s true throughout the cast. Dockery, O’Connell, McNairy, Brodie-Sangster—they all give great performances, and those performances sometimes highlight the shallowness of the script. Only Merritt Wever’s Mary Agnes avoids that particular pitfall. That’s in no small part due to Wever’s extraordinary artistry, but it’s also because the character’s story exists on that more intimate scale. Hers are human concerns, often leavened by humor. Not a trace of the biblical to be found. Taken episode by episode, “Godless” may find greater resonance. The hectic pace of watching for review doesn’t necessarily suit a series not only willing to take its time, but downright adamant about doing so. Even if the flaws remain obvious, it’s worth following this story into the desert. There’s great acting to be found, and some thoughtful writing—and if you like sweeping panoramas of the sun setting across an untamed wild, then you’re in excellent, if heavy, hands.